"Well it finally happened..... 3rd let go in my stock box today. Its behind a 2.8 with twin RS's... I know 3rd is the weakest link and I am always a pansy shifting into 3rd. It is a road car so im not interested in straight cut noisy gears." Third gear is a weak link in the Nissan gearboxes. Its at the center of the stack, and we think the gears walk a little bit outward on each other and then shear all the teeth off. There is also a mismatch in the stack of gears. In the following picture of the OS Giken gearset, you can see the gears don't mesh up 100%. In the above picture is an early and late R32/R33 gearbox. Some people try and say the later boxes are stronger, theres a picture of two broken gearsets. An OS Giken Gearset is an option. The OS Giken gearset is stronger. Good for about 700 hp. Not unbreakable. It can and will break. The 1st gear is longer, 2nd, 3rd , and 4th closer together. You will hear this transmission called a "crossmission". It actually should be called a "closemission" or "crosemission" . Japanese and their R's and L's , B's and V's. Just a pronunciation error. There is an optional 5th gear, but you can run the standard 5th gear. 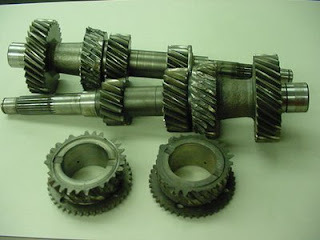 The OS gearset is helical cut gears with synchros . It drives and feels like the stock gearbox. The R34 GT-R Getrag is always an option. They are the same/similar V160 that is in a Toyota Supra. The Supra guys have pretty good luck with them. In GT-R's we tend to break synchro sprags, and that type of thing. The Getrag is a good box, 6 speed. A little noisy. Sounds like a box of rocks at idle. You need a new transfercase as the Getrag uses a unique bolt pattern on the transfer end. You also need a new clutch, or actually a new flywheel as the height is different. New main driveshaft or section, new propshaft. Couple other minor things. The Getrag was setup for 3.54 main gears , so the stock R32/R33 4.111's might be a bit steep. You have an extra gear though, so its not too bad. Other options are all racing style,no synchro boxes. Pfitzner Performance (PPG) , HKS, Holinger ,Quaife , Greddy, OS Giken Sequential(OS88) , Automatic options . Redline Shockproof Heavy(not in the Getrag) , a twin plate sprung hub clutch, and shift easy into 3rd.